We recommend spaying all female pets. 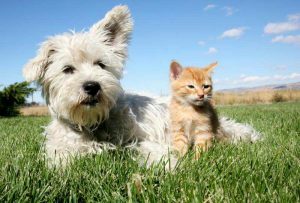 The benefits to your pet’s health and to help reduce the pet overpopulation crisis make this decision easier. Prevention of “heat” or estrus. Elimination of the hormone fluctuations that cause false pregnancy following the “heat cycle”. Prevention of breast cancer. Dogs spayed before their first “heat” have less than 0.5% chance of developing breast cancer. Most of the perceived disadvantages are false. The most quoted of these are that the dog will become fat, lazy, and useless as a guard dog. Obesity is probably the most commonly quoted disadvantage of spaying. Obesity is the result of overfeeding and lack of physical activity. The role of female hormones in preventing obesity is poorly understood. By regulating your dog’s diet and caloric intake, you can prevent obesity in neutered or intact females. Eliminates the risk of testicular cancer, the second most common cancer in intact dogs.